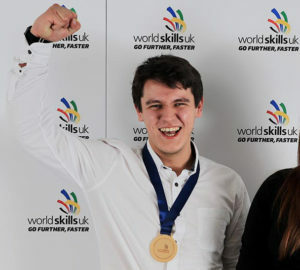 SkillFRIDGE 2018 reached its zenith at WorldSkills UK LIVE from 15-17 November, as the finalists vied to keep their cool and come away with the coveted gold medal. After a series of hard-fought regional heats, six talented apprentices studying up to Level 3 RACHP qualified for the WorldSkills UK LIVE final at Birmingham’s NEC. Observed by expert judges, each finalist faced three air conditioning and refrigeration tasks designed to assess competence in building and commissioning, repairing and testing, and pipework and brazing, as well as electrical skills and, of course, safe working practice. Following two days of intensive competition, Dominic Dray of Royale Refrigeration & Air Conditioning was crowned SkillFRIDGE champion and took home the gold medal for 2018, with his training provider, Eastleigh College, receiving the SkillFRIDGE Shield. SkillFRIDGE gold medallist Dominic Dray. Meanwhile, Sam Gills from Star Refrigeration took the bronze medal position. Though all the competitors were inevitably going for gold, simply taking part has enabled them to develop skills that will be invaluable throughout their careers. SkillFRIDGE aims to bridge the skills gap and raise industry standards by inspiring and educating young talent, so providing participants with top quality technology is vital. 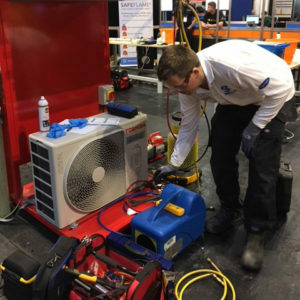 The RACHP skills competition has forged links with many of the foremost air conditioning and refrigeration businesses – industry leaders which have demonstrated commitment to the future of their sector by supplying their solutions, equipping up-and-coming engineers with the tools they require to succeed. The 2018 series final saw competitors complete their tasks using front line innovations from the likes of Toshiba, which donated two of its air conditioning unit test rigs; Beijer Ref, whose condensing units were supplied by UK wholesaler Dean & Wood; and Climalife, which provided six leak detectors – an increasingly crucial piece of kit as more flammable refrigerants become commonplace. A-Gas, meanwhile, donated oxygen, acetylene, nitrogen, R410A virgin refrigerant and an R410A refrigerant receiver – all delivered by distributor FSW. Advanced Engineering also donated an array of ACR essentials, including six Promax 240v recovery units for R410A and R134a, six Robinair 3cfm 240v vacuum pumps, and leak detector spray. The manufacturer and distributor also equipped competitors for the flame brazing aspects of the contest with six of its compact Oxyturbo Turbo Set 1000 kits. Equally instrumental to the brazing tasks were two Safeflame brazing units donated by Safeflame UK. Putting safety at the forefront, these feature separate pressure gauges for hydrogen and oxygen – and if the pressure exceeds 0.5 bar, the system shuts down. Copper and silver alloy piping and materials were donated by Lawton Tubes. Vulkan Lokring supplied a range of tools and fittings, and essential components were also provided by Pendle Refrigeration and Coriolis International. Finally, Fieldpiece supplied an array of test tools including its JL3KH6 Job Link System Charge and Air Kit, which allows measurements to be sent via an app to a mobile device. A first for SkillFRIDGE, this meant competitors could easily capture and document their commissioning logs, sending them to Mr Forsyth as direct evidence. Following an outstanding competition series which has seen the standard of participants reach new heights, plans are already in motion for the 2019 cycle. Those companies who wish to show their support for the industry’s future are advised to secure their sponsorship as early as possible.